Most everybody falls at some point in their life. When you are young, you are closer to the ground and may be more flexible and “bouncy.” As you get taller and further from the ground, falling can have greater consequences. As you create movement habit patterns, you may or may not be optimizing your body for taking a fall. “The key to reducing your risk of falling is to strengthen your body in a way that gives you a confident gait, which in turn strengthens your body even more….” Bowman, Katy. Dynamic Aging: Simple Exercises for Whole-Body Mobility, Propriometrics Press 2017, p. 56. A student of ours in her 70s slipped and fell during a class at our local senior center, wearing stocking feet on a slippery floor. Although nothing was broken or fractured, it took her more than two months to recover. This motivated me to find a class where I could learn how to safely fall. 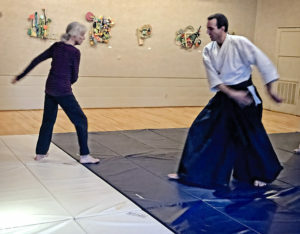 I turned to Aikido for fall “retraining.” While in my 60s, I enrolled in an Aikido class to enhance my confidence and necessary skills for working in a psychiatric hospital. It was with a little trepidation I signed up nearly 20 years later. Much to my delight, I found the class helpful and fun. 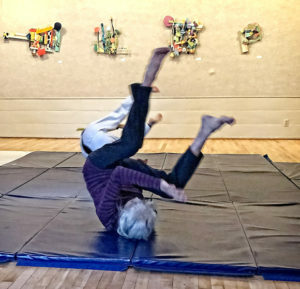 You’ve likely felt the startle of awareness when you’re off-balance and vulnerable to a fall. Perhaps you tensed and held your breath. A change in weight distribution or grabbing something stable may help stop the fall. Or relaxedly lowering your center of gravity may save us or give us a softer landing. But there are trip- or slip-and-falls which only give us time to inhale, relax our muscles and get our hands ready to catch us. Then preparing to protect our head and roll, exhaling on impact. Falling straight back is never a satisfactory option. In my first current Aikido class, the Sensei taught the importance of inhaling on the initial stage of a fall and exhaling on impact. Even though I’m 78 years old this year and had not kept up an Aikido practice, fear of falling in class was not a factor. The calming, pre-action inhale which unites mind and body is something we can incorporate in Nutritious Movement, Yoga, gardening, window-washing, et al. There’s a beauty for me in paying attention to my breath in this way. Body memory has helped me in the past, and to knowingly draw on the life-force of breath feels satisfying and powerful. 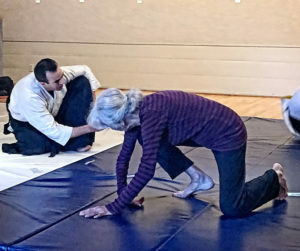 “Aikido training can help us all in so many ways, young and old alike. 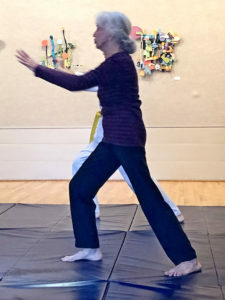 The martial essence of our exercises sharpen the mind and help connect us with our best kinesthetic self through whole body movement and basic forms of agility training. In Aikido, the art of falling (ukemi) constitutes at least half of our daily training. We have specialized techniques to keep the body safe during sudden and otherwise harsh falls. 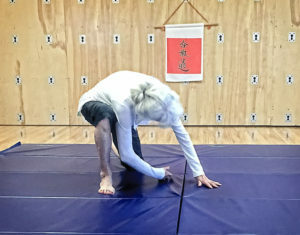 “Our training on the mat keeps us safe in the routine of daily life thanks to muscle memory of technique, increased strength and body awareness, and a more comfortable association with getting to the ground, among countless other benefits. We are now working with Sensei Jones to offer a 7-week Aikido class to help people of all ages prepare for falling.